While I would definitely say, of the nine "possible positions of need" the above chart kind of hits the main needs the order is off (if that is the projected order of need). Lions fans would love to see Dee Milliner in Honolulu Blue (AP). 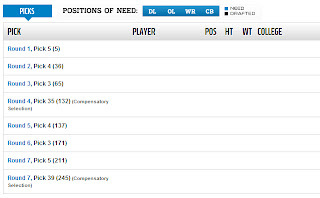 If I were the Lions GM... 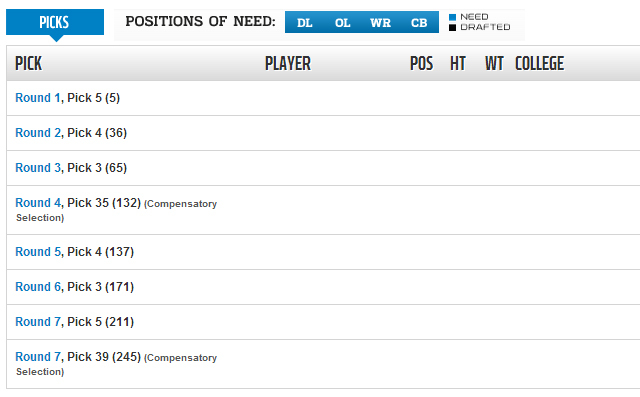 I would focus on the defensive secondary in the first two rounds. Period. 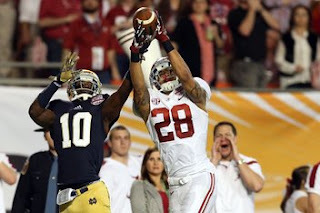 Adding a corner (Alabama's Dee Milliner) with the No. 5 pick and coming back with a safety (LSU's Eric Reid or South Carolina's D.J. 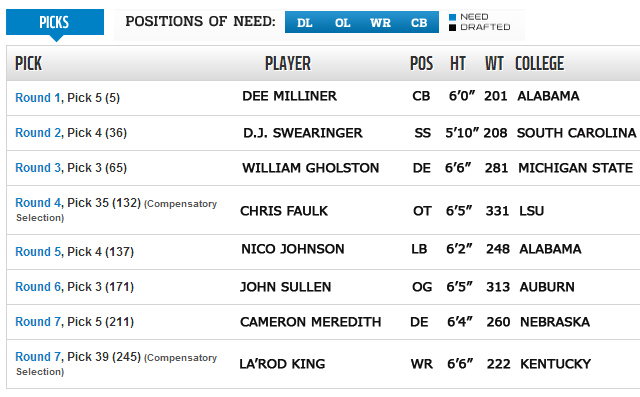 Swearinger) with the 36th pick gives a horrific secondary a bright look for the future. 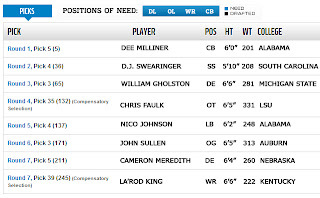 Now, I realize the Lions added Glover Quin in free agency and resigned Louis Delmas but I like taking a major weakness and making it a major strength rather than just making it serviceable. That's why I like a safety in Round 2. Then I would address the defensive line in Round 3. I don't see a huge need at defensive line with the signing of Jason Jones, a five-year NFL vet out of Eastern Michigan and the solid emergence of Willie Young. (I said much of last year that I thought Young would be the main reason why the Lions did not resign Cliff Avril. I don't think it was the reason but I do think it played a factor). Still, seeing as how Detroit likes to rotate its defensive ends then adding MSU's DE William Gholston (6-6, 281-lb), LSU's DE Sam Montgomery (6-3, 262-lb DE) or Illinois' DE Michael Buchanan (6-5, 255-lb) makes perfect sense. There are still solid tackles on Day 3, especially since outside of Eric Fisher and Luke Joeckel, both projected to both go in the Top 4, ever tackle has "some question mark." Remember, while he fell into their laps last year the Lions did take Iowa OT Riley Reiff. A projected Top-10 pick the solid Reiff fell to No. 23. The Lions gladly snapped him up. He's a tackle who can also play guard. But taking another tackle the following year just doesn't make sense (unless you are the 49ers and have no pressing needs and have the luxury to do whatever it is you'd like). Naturally, since I'm not the GM nor can I claim to be a NFL Mock Draft expert this is not likely anything close to what the Lions will do. Detroit will probably go with a lineman in Round 1 and even Round 2. If Detroit takes a LB early that makes sense. But as I stated before, this is how I could see the Lions draft going (sans potential trades) and I believe Detroiters would have to be very, very happy.